Several film bodies have come out to support director Sanjay Leela Bhansali's Padmavati and questioned the government's silence on the threats issued by Rajput groups and others against the film's release. A brew of film bodies -- IFTDA (that's the Indian Film and Television Directors Association), CINTAA (that's the Cine and TV Artists Association), WICA (that's the Western India Cinematographers Association), SWA (that's the Screenwriters Association), ACTADCD (that's the Association of Cine and Television Art Directors and Costume Designers) turned up at a press conference on Monday, November 13, to back Bhansali whose December 1 release is currently under a state of siege from Rajput royalty and others who challenge the moviemaker's portrayal of history. Of course, all this anger without seeing Padmavati, which is based on Bhansali's French opera. "The attack on Bhansali is an attack on freedom," director Sudhir Mishra declared. "This is very stifling. When it comes to interpretation of history, you can disagree with him, but at least allow the film to release," Mishra said. "By asking for a ban, you are creating an atmosphere where nobody will attempt films on Indian history." 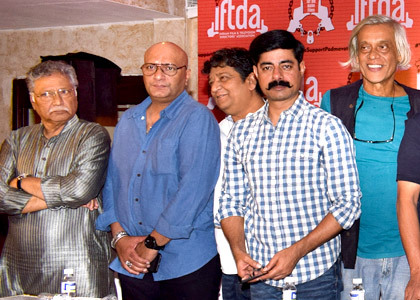 IMAGE: At Monday's press conference: From left to right, Vikram Gokhale, Amit Behl, Zama Habib, Sushant Singh, Sudhir Mishra, B P Singh, Kushan Nandy, Ashoke Pandit, Rahul Rawail, Sukant Panigarha and others. Bhansali has faced trouble since he began shooting the epic. The movie's sets were vandalised twice -- in Jaipur and Kolhapur -- and the director was roughed up by Karni Sena activists in Jaipur earlier this year. 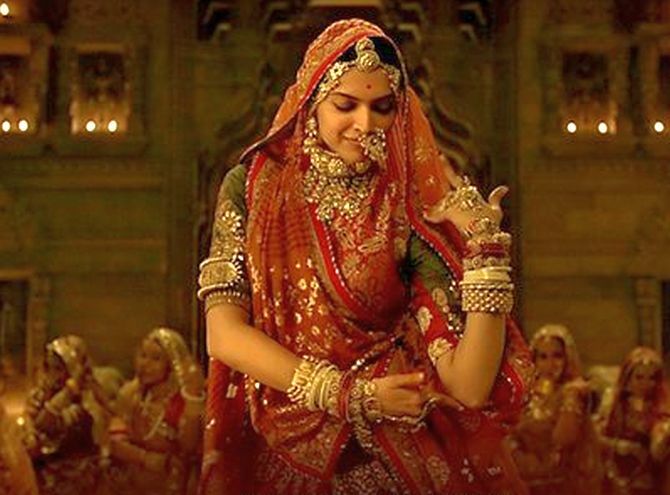 Rajput groups, Rajput royalty and some BJP members accuse Bhansali of distorting facts in the film, which stars Deepika Padukone, Shahid Kapoor and Ranveer Singh. Bhansali has already clarified that there is no dream sequence between Deepika's Padmavati and Ranveer's Allauddin Khilji as claimed by Rajput groups. "Sanjay Leela Bhansali didn't ask us to hold this conference... We are all frustrated, angry and upset," actor Sushant Singh, who is also the CINTAA general secretary said. "For how long will our fraternity keep asking for freedom of expression to make films? Why do we need to fight for such a basic right all the time?," Singh asked. "My question is for the state and central government: Why are you silent? People from your parties are openly threatening to burn theatres. I have the right to ask for an assurance from the government," Singh added. Filmmaker Ashoke Pandit, the IFTDA convenor, said the film industry has been pushed to a point where they feel abused. "We are hurt because we have been abused and accused. We are filmmakers, creative people and we don't deserve this kind of treatment," Pandit said. "Every now and then we see our makers being heckled. We work hard, we make films. Bhansali is a symbol and an attack on him is like abusing the film fraternity," he said. On November 16, Pandit said, a silent protest outside the Film City studio gates in north west Mumbai will support Bhansali. "The entire film fraternity will come out at 11 am. No shooting will be done from 4 to 4:15 pm as a symbolic support to Bhansali," Pandit added. "I am against private censorship," said actor and CINTAA President Vikram Gokhale who worked with Bhansali in Hum Dil De Chuke Sanam. "I have worked with Bhansali, he is a responsible man," Gokhale said. "Even if he has made a mistake, you have a pen and media platforms to express your opinion. But vandalising sets, indulging in physical violence is extremely foolish."